SNOHOMISH, WA: Big Trees Inc., (http://bigtreesupply.com/), a large tree nursery and tree transplant company, was asked to replace a large plant in a difficult to reach area of the client’s property. The client’s neighbors opened up a large view corridor between the client’s windows by removing an existing hedge on their side of the fence line. Wanting a solution immediately, the client contacted Big Trees. One aspect of the project was to find a plant large enough to replace the previous hedge. The second aspect was the access into the backyard was too small for the needed equipment to handle a larger plant. Big Trees found a larger Portugal Laurel in their nursery that fit all of the specifications needed to fill the new void. The next challenge was to figure out how to get the 3,000-pound Laurel into the backyard. After going through different options, it was decided to hire a crane and send the tree up and over the house. When the day came for the project, the crane was set up and moved the Laurel, over the house, as close to its new planting hole as possible. 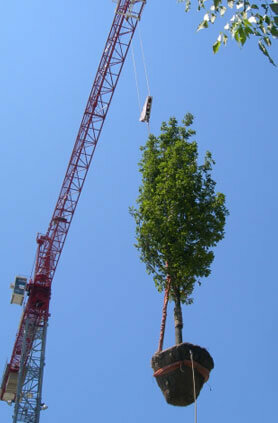 Once released from the crane, the Big Trees crew physically dragged the plant to its new home. The clients were thrilled to regain the privacy they desired.